At Sahara Air, we recommend, sell and install Amana Air Conditioning Systems. Our professionally trained HVAC techs are expert in helping you find the correct system for your home or business, and will install it properly, ensuring years of efficient, dependable service. Amana produces high efficiency air conditioning and heating systems that help reduce your utility bills while keeping your family comfortable, all year round. When choosing a new heating or cooling system for you home, there are many things to keep in mind…size and age of your home, number of rooms, utility costs and more. The HVAC experts at Sahara Air have been helping people select the perfect system for their needs for over 30 years. 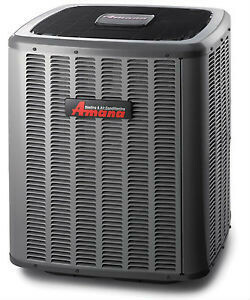 Why Choose Amana for your heating & Cooling needs? If the heat exchanger in this gas furnace ever fails for the original, registered homeowner, we will provide a new furnace. If the compressor ever fails to the original, registered homeowner, a new air conditioner will be provided at no cost. Amana’s complete line of residential and commercial equipment from air conditioners, gas furnaces, heat pumps and air handlers has been keeping families and businesses comfortable since 1934. Amana lasts and lasts and lasts.